This is an early version, so some problems exist. LiveHTTPHeaders (http://livehttpheaders.mozdev.org/) is also a good option for this – more of a swiss army knife, also allows replay. Actually, Adrian Holovaty also brought up Live HTTP Headers on my blog. 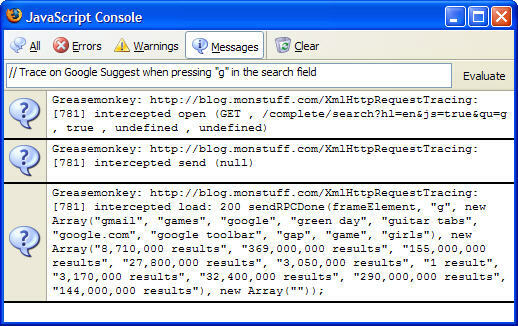 But it is not that suitable for debugging AJAX: it doesn’t show the body of the response. Also, I’m working on more AJAX-specific features (not available in Live HTTP Headers), such as edit and replay for callbacks, and possibly even setting breakpoints and editing XMLHttpRequest calls. And, of course, there’s the buzzsaw of network troubleshooting tools (and my personal favorite), ethereal. If you are using windows, then http://www.fiddlertool.com/fiddler/ is damn fantastic for debugging an HTTP message flow. Within fiddler you can even manually edit and then resend GET/POST requests – useful!